A few weeks ago we contacted Bruno Feitler, the nephew of art director Bea Feitler, and the initiator of a recently published book about her life and work. 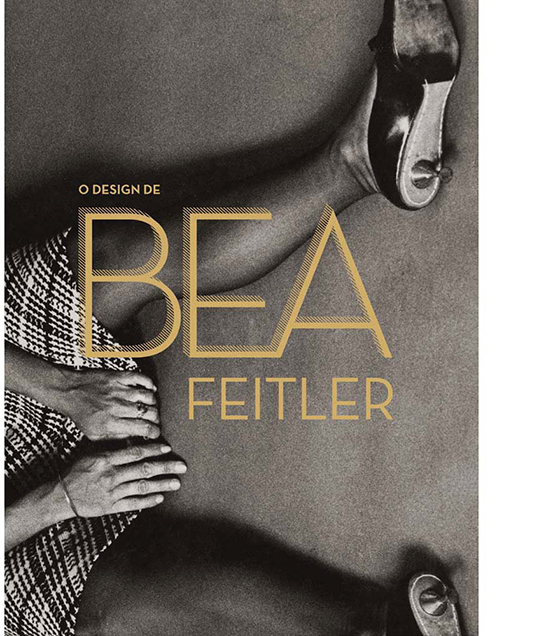 Bea Feitler was an outstanding designer who unfortunately passed away in the 1980s (how we wish we could’ve paid tribute to her with a Hall of Femmes book). 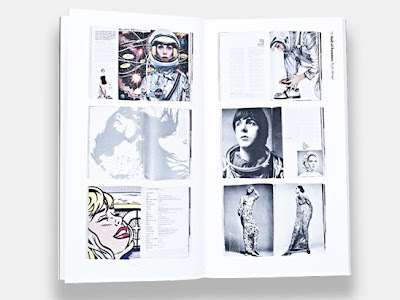 She was Ruth Ansel’s art direction partner at Harper’s Bazaar in the 1960s and gave the form to Ms Magazine, Rolling Stone, and numerous book covers. 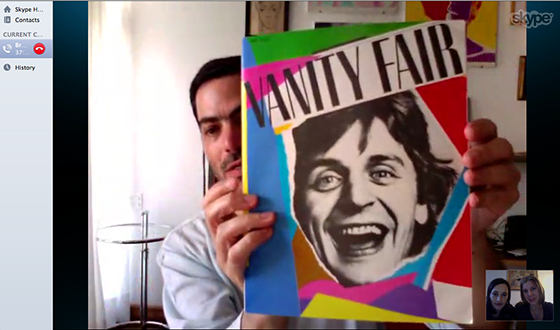 We skyped with Bruno who lives in Sao Paolo on a cold winter Sunday in Stockholm. Is Bea well known in Brazil? Is she a kind of design celebrity? Because of the book now: yes, but maybe five years ago, much less. But she was well known while she was alive. Once a year when she came to Brazil, there would be something about her in the newspapers. But when she passed away, after a while, nobody talked much about her. Can you tell us a bit about her background, and why she went to New York? When she was 18 she wanted to study something related to fashion, and my grandparents decided to send her to New York to study at Parsons. She had an aunt in New York, so maybe they decided to send her to the United States and not to Europe, or somewhere else, because of that. Once there, she realized that she wanted to study graphic design. After her degree, she came back to Brazil where she started to work at a magazine called Senhor. It was a very important publication at the time, and she worked there from 1959 to ’60. 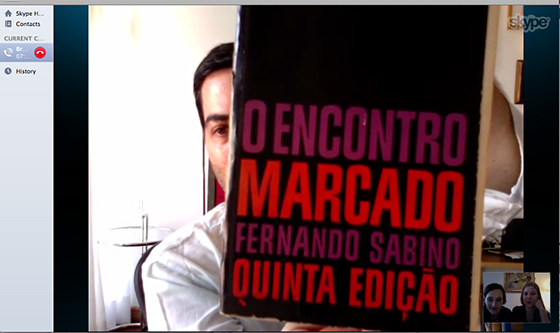 And she also designed very, very important covers for important Brazilian authors at the time. Do you have the books that she did those covers for? Yes, I have one here, O Homem Nu. It’s in very poor condition, but it is iconic of design in the ’50s and ’60s. I also have this one. O Encontro Marcado. You can see the palette of colors she uses. She also worked for an art gallery, making invitations and posters, very typical of that period as well. 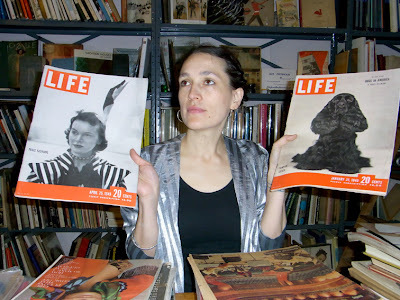 But when she was fired from the magazine together with the main editor, she decided to go back to the United States after only one year in Rio. She started to look for work there, and that’s when Marvin Israel approached her. Because Marvin Israel used to be her teacher at Parsons? Yes, he taught at Parsons and that’s how she knew him. But there’s also Diana Vreeland, she says somewhere that someone had spoken very highly of her, that’s why she was hired. Bea Feitler, Bill King, Ruth Ansel. New York, 1965. What’s so special is that there were two art director’s assistants hired at the same time: Ruth and Bea. Do you know anything about how they worked together from Bea’s point of view? It’s very hard for everyone who was there: for Ruth, for some photographers that I interviewed, people that were assistants for Bea later, to explain how they worked together. But Avedon wrote something about that once, saying that one was the classic and one was the modern, Bea being the classic. In fact there was emulation and a lot of collaboration, making it sometimes difficult to say exactly who did what. One would come with one idea, that would be developed by the other one, and then maybe reused by the first one in another spread of Bazaar. We have gotten the impression that Bea was a wild child and a rebel. What’s your thoughts on that? Yes, she was very exuberant! And everyone mentions the bracelets that jingled when she walked. Yes, I remember her necklaces with Brazilian things hanging, and the bracelets I really remember also. And she was very expansive. But she knew of course, in design, what would be the best solution, what would be the best thing to do. In Rio, before going to Parson, she used to come every week to the opera house in Rio, to watch ballet and opera, she was really passionate about ballet. 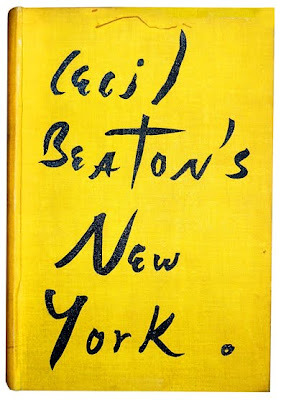 And in NYC, while still studying, every week she would write a friend of hers about ballet and not much about work. But she also wrote in a couple of those letters (and I write that in the book) that she noticed during school that she needed a high-voltage tension. She needed to do all these things at the same time, she needed all this information coming out, and without that she wouldn’t be happy. For example: when she worked with Bazaar, she also did a magazine here in Brazil and no one knew about that. It’s called Setenta, “Seventies”. So here’s the first issue. And nobody in United States knew, because she was still hired at Bazaar, so she couldn’t be working with other things. 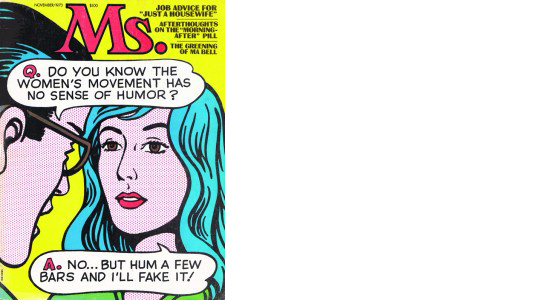 She was an advisor but she also made the layouts for some issues. 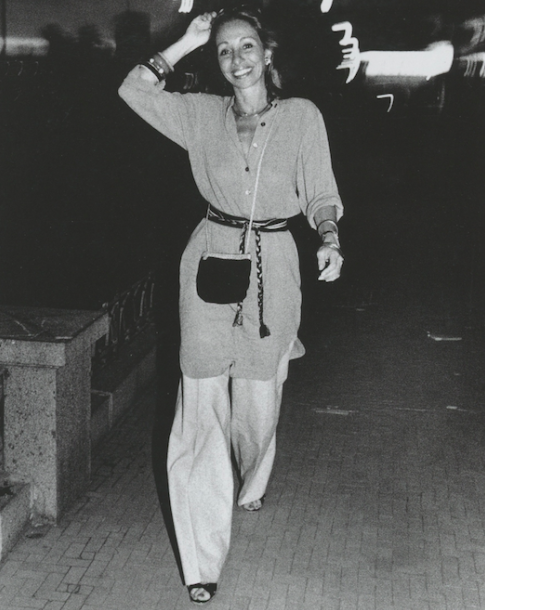 For instance, she took Bill King to Brazil to take photos for this magazine. There are some gorgeous pictures and gorgeous spreads. She did that secretly and there were some spreads and some pictures that were used in this magazine and later, also in Bazaar. She mixed things up. That’s daring, two-timing Harper’s Bazaar … So she needed stimulation? Yes, she needed a lot of things at the same time, working a lot, later also teaching at the SVA, and having the rhythm that they had in New York at that time. And that was not the same in Rio. My mother passed away very early. My father passed away, Bea passed away in the ’80s, my grandparents too. So it was a way for me to remember all of them at the same time. Since we haven’t read the book, because it’s in Portuguese, how is it written? Is it from your perspective or from a design history perspective? We didn’t want the book to be sentimental. 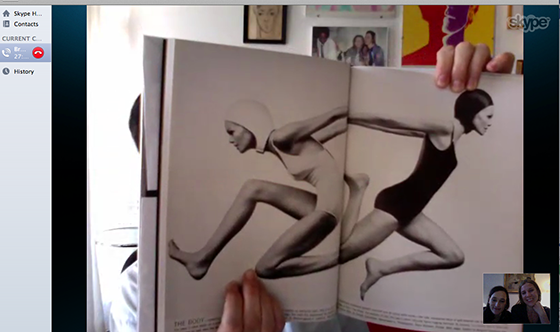 In the book there are two texts: one is my text, a personal biography, it goes sideways when you hold the book straight, so you have to turn the book to see texts and images that relate to her personal life. 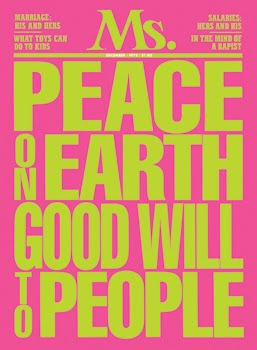 And all the work images, and the text with design analysis, are set out in the regular way, written by André Stolarski, a great design theorist among many other things. 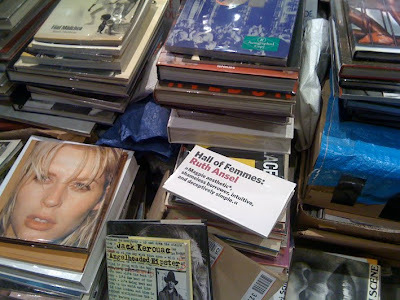 Stolarski analysis of Bea’s work is amazing, and his text is the most important one for the book. Unfortunately he recently passed away. 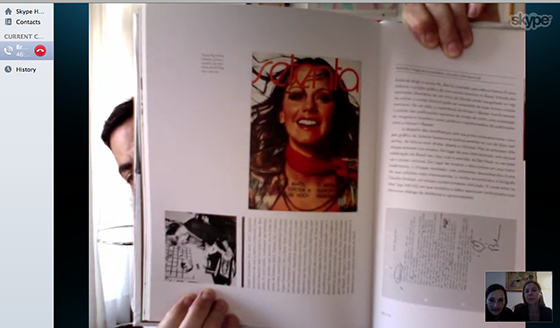 The book’s layout was a way Elaine Ramos found to play with Bea’s idea of the use of text as image. 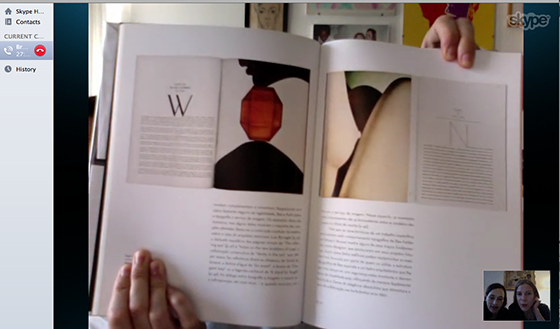 The size of the book is the same size as Bazaar’s magazine. So it makes it easier to reproduce some of those images. Has the book been well received? Very well. We got a lot of good press. Can you say something about her work at Ms magazine? 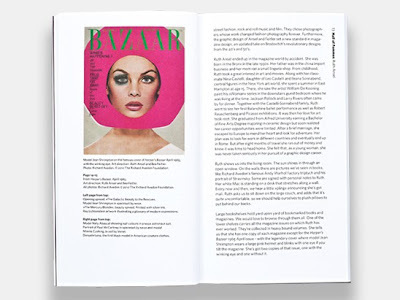 After leaving Bazaar in 1971, Bea was called by editor Gloria Steinem to be the art director of Ms magazine, which was just starting. It was a huge success. 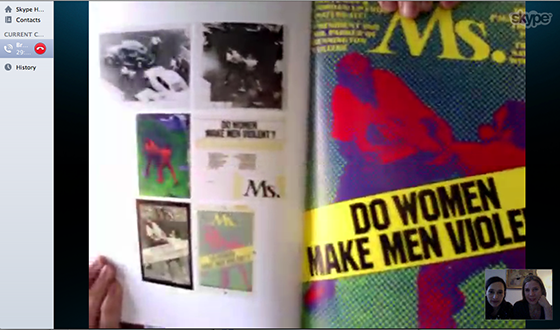 According to André Stolarski, Ms’ popularity was a direct consequence of its graphics, and thus also was the influence of feminism in the US. 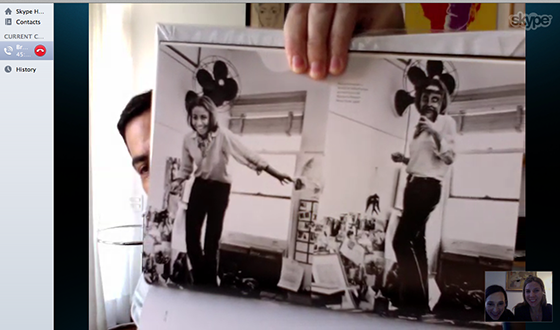 It was in fact a pop magazine, and Bea was able to gain a lot of space for images over text in it. Ms while dealing with political and serious social matters, was visually agitated, informal, and also well humored, what certainly helped its popularity. Bea worked there until July 1976. Can you tell us something about how the photographer Annie Leibovitz and Bea worked together? Bea asked Annie to shoot some photos for Ms. magazine, and that’s how they got in contact. Annie then had Jann Wenner call Bea to do some special projects for Rolling Stone, where Annie was the head photographer; works as “capturing the soul. Seven master photographers”, of May 1976, or the 10th anniversary issue, of 1977, a huge work of edition of Annie’s photos. 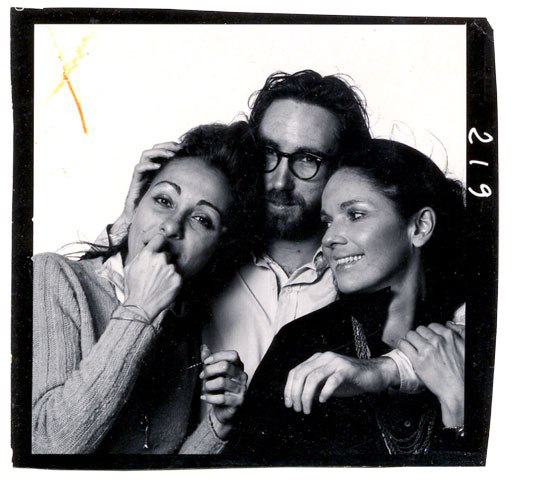 Once Rolling Stone moved to NY, Bea started collaborating even more, first as consultant art director and later as design director. For Annie it was very important to have Bea there. 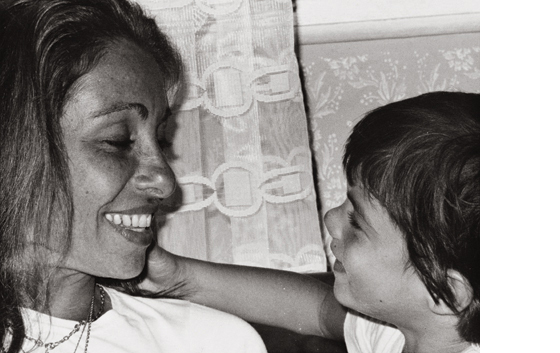 Have you seen the documentary Behind the Lens? Annie said that Bea took her under her wing and taught her a lot. Actually, that was one of the starting points for Hall of Femmes, when we saw that documentary, because it was the first time we ever heard a woman speak of another woman as a mentor and give that kind of credit to another woman in a work collaboration thing. So it got us really curious about Bea and about the whole mentorship between women. They had a very intense relation. 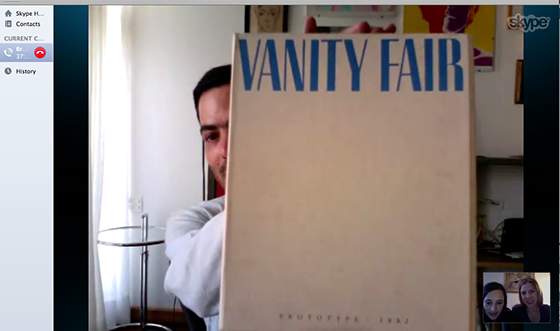 And Bea was the one who took Annie Leibovitz to fashion, when she worked on the prototype for Vanity Fair. Do you want to see the prototype? What made Bea the mentor type? 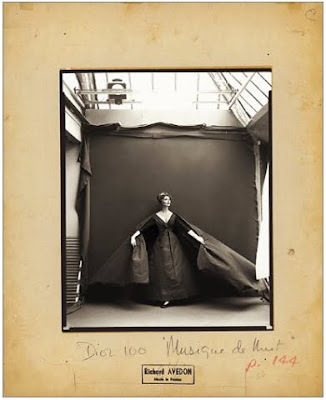 She recognized talent, and what would become the focus of that photographer or artist. For example, Richard Wilde (director of the SVA) told me that Bea paid attention to Keith Harring when he was a student, at a time when other people would not. With photographers and designers, she would know which path they had to follow. She would know how to make them develop their own personality. Thank you for taking the time to talk, Bruno, bye! Bruno Feitler lives in São Paulo, Brazil, where he is a Professor of History at the Universidade Federal de São Paulo, with studies mainly on the Church in Brazil and the Portuguese Inquisition. 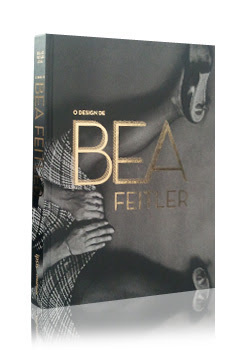 O design de Bea Feitler is published by Cosac Naify and ipsis in 2012. Buy it here , even if it’s in Portuguese, it’s worth it. Bruno with Bea, 1976. From the Cosacnaify blog. För dig som klarar av att läsa en extremt ful och svårläst blog: här berättar Richard Avedons assistent historien om hur Avedon fotograferade till Ruth Ansels och Bea Feitlers rymdnummer av Harpers Bazaar 1965. Boken om Bea Feitler, gjord av hennes bror Bruno Feitler. I går skypade vi med tidningsmannen Roger Black för att fråga om hans samarbete med Mary Shanahan på Rolling Stone. Han berättade att förutom Marys osvikliga känsla för fotografi, var hon även en smart organisatör med en förmåga att sätta samman bra arbetsteam. Precis som alla andra vi pratat med älskar han Mary. Han blir glad att höra att hon ska få en bok och vi undrar om det är för att hon har fått för lite uppmärksamhet. Han säger att så är det absolut men att det delvis beror på att hon själv är helt ointresserad av bekräftelse på framgång. Som exempel berättar han om när Mary efter en prisceremoni på Society of Publication Designers (SPD) tog emot flera priser för tidningen men slängde dom i soptunnan på väg hem. 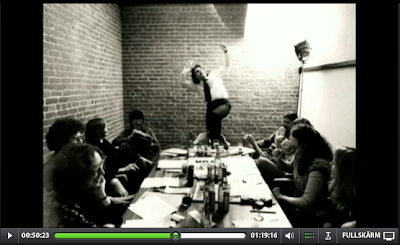 Rock’n’roll, Mary! 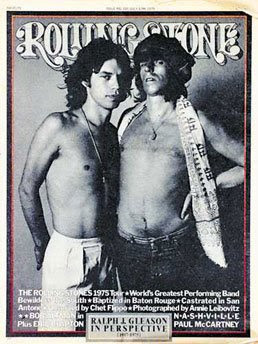 Roger berättade också om Annie Leibovitz tid på tidningen efter hennes vilda tid som The Rolling Stones turnéfotograf, en period med intag av så mycket droger att det nästan kostade henne karriären. Nu går dokumentären om Annie Leibovitz i repris här, gläds även åt inslagen med Ruth Ansel och berättelserna om Bea Feitler. På den här skärmdumpen från filmen tror vi att det är Mary Shanahan som sitter längs fram till höger. Mannen som står på bordet gissar vi är chefredaktör Jann Wenner som fått en väldigt, väldigt, väldigt bra idé. Bea Feitler har beskrivits som en rule-breaker, en ball-breaker, en bad girl, en självsäker kreatör som följde sitt eget huvud och inte tog direktiv av någon. En högljudd brasilianska vars skramlande armband hördes på långt håll och som ändrade layouter efter att dom hade godkänts av högsta instans men ändå inte fick sparken. Den typen av rebelliska kvinnor är ovanliga. När vi började söka information om Bea Feitler och läst och hört beskrivningarna ovan, tittade vi på varandra och sa i en mun ”Hon måste vara gay.” ”Hon måste gått på droger.” Som vanligt hade vi rätt båda två. När vi bett Ruth berätta om hur hennes och Beas relation var har hon sagt att de levde olika liv och inte visste mycket om varandra privat. Ruth drar sig till minnes att Bea under flera år bodde tillsammans med en vacker brasilianska som hon med ett leende presenterade som: ”My roommate.” Utan att Ruth förstod ett dugg. Bilden ovan: Bea Feitler och Ruth Ansel på en Halloweenfest hos Ruth. Foto av Diane Arbus, tidigt 60-tal. 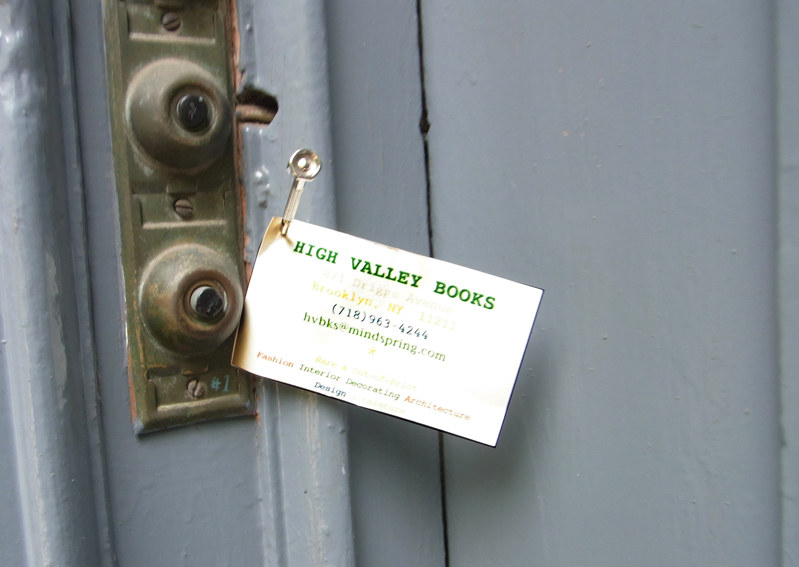 High Valley Books är ett hemma-hos-antikvariat ”by appointment only” som specialiserat sig på rariteter inom mode, fotografi, konst och design. Utanför porten hänger ett visitkort, det är allt som avslöjar den diskreta entrén. Innehavaren Bill Hall har sitt bibliotek hemma i vardagsrummet och säger att vi får ”poke around” hur mycket vi vill. Och det gör vi. När vi är klara har vi samlat på oss alldeles för mycket men vi byter våra medhavda Hall of Femmes böcker mot en bunt T Magazine formgivna av Janet Froelich. Som om Bill kunde läsa våra tankar (inte så svårt) säger han innan vi går ”jag är här imorgon från nio – om ni vill komma tillbaka.” Vi tackar och säger att vi ses då. Tidningen Gentry som vi skrev om i ett tidigare inlägg. Världens vackraste handstil, Cecil Beatons. Blanda omslagen och du får hon i mitten. Harper’s Bazaar, omslag med utvik formgivet av Ruth Ansel och Bea Feitler. När Bea Feitler var art director på den feministiska tidningen Ms 1972, ändrade hon slutet på den traditionella julhälsningen ”good will to men” och riktade den istället till ”people”. Om du ska åka till Paris och känner för att ha en hjärtat-slits-ur-kroppen-för-varje-bok-du-måste-lägga tillbaks-i-högen-upplevelse, så är det här bokhandeln du ska gå till. Comptoir de l’image på 44 Rue Sévigne. Plötsligt upptäcker vi Hall of Femmes: Ruth Ansel på en bokhög. Efter att ha stått och kuttrat med boken i handen i fem minuter och häpet och lyckligt bläddrat fram och tillbaka i den tio gånger för att försäkra oss om att det verkligen är samma bok (det är den fast den kostar 38 euro, några hundra mer än vad vi tar för den) dristar sig butiksägaren till en gissning: ”Är det möjligen så att ni har gjort den där boken?”. Det visar sig att Monsieur kände Bea Feitler (une femme extraordinaire) under ett år på 60-talet som Avedons assistent. Han undrar om vi inte ska göra en bok om henne någon gång? Monsieur berättar om sitt år i New York, om Hiro och Avedon. Tid och rum försvinner, tills vi smiter ut i Paris-skymningen. P.S Köpte inte boken, så den finns kvar. Mary har varit ad för tidningar som Rolling Stone, GQ, Cuisine (en nyskapande mattidning som bara kom ut med 11 nummer) och franska Vogue. Hon har också varit Richard Avedons personliga ad under många år och gjort flertalet fotoböcker för både honom, Hiro och Mary Ellen Mark. 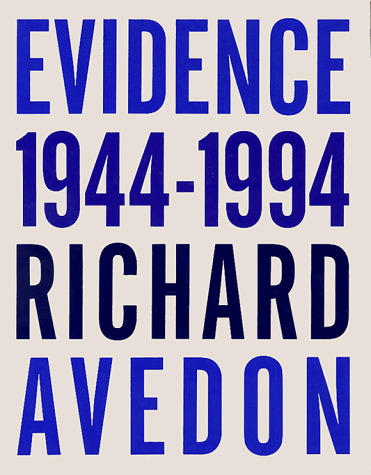 Boken ovan heter Made in France och kom till när Richard Avedons agent hittade en låda med gamla vintagefoton som han ville göra något med. 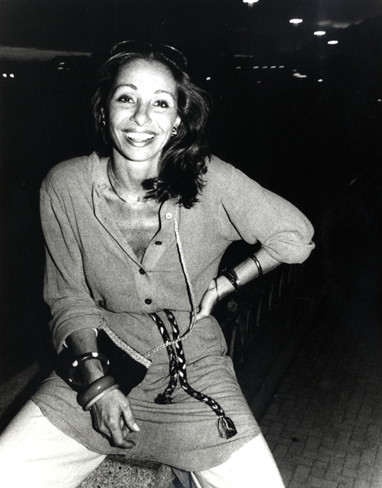 Avedon ringde Mary Shanahan och frågade vad hon tyckte de skulle göra med materialet. Mary svarade att de borde göra som en faksimil där allt visades precis som de var, även kartongen med de handskrivna anteckningarna på. Hon kom också på bokens titeln Made in France eftersom det var just det som var stämplat på fotografiernas baksidor, förmodligen för att det behövdes när de skulle igenom tullen. Hon berättar att det var en underbar bok att arbeta med men att hon tyvärr inte kunde slutföra den då hennes dotter blev sjuk. Sen säger hon plötsligt ”Så då bestämde han att ange en annan person* som art director.” ”Oj…” säger vi lite tafatt för vi märker att Mary håller den här boken högt. ”Konfronterade du honom med det?” Mary är tyst och säger sen nej. ”Man kanske inte konfronterar Richard Avedon?” undrar vi. Mary svarar indirekt att när man arbetar med någon som är så fantastisk men också så komplicerad så får man ta personen som den är. ”Vi har gjort så många fantastiska jobb tillsammans, yrkesmässigt de bästa jobb jag gjort och det hela var redan tryckt, det fanns ingenting att vinna på det för min del. Jag står med i tacket tror jag Efter en grundidé av Mary Shanahan… eller nåt sånt men jag gjorde verkligen hela boken.” Kort efteråt sa hon till Avedon att hon inte kunde arbeta mer eftersom hennes dotter var sjuk ”Men jag vill att du ska göra min nästa bok!” ”Only if you put my name on it” svarade Mary. I slutet av 90-talet slutade hon jobba heltid hos Avedon eftersom hon bestämt sig för att adoptera barn, något som inte var förenligt med hans behov av ständig kontakt. När hon berättade nyheten för honom sa han att de måste ta en lunch och diskutera saken. Sedan gav han henne hundra anledningar till varför hon inte skulle göra det. ”Första tiden med min dotter rådde verklig syskonrivalitet dom emellan” skämtar Mary. Marys förklaring till varför kvinnor inom yrket faller bort är helt enkelt att hon tror att kvinnor har intressantare saker för sig än att jobba. Liksom vid förra intervjun upprepar hon att karriär aldrig varit det hon satt i främsta rummet. ”Jag älskar det jag gör och jag älskar fotografi men det har aldrig kommit i första hand för mig” Vi frågar henne om hon tror att hennes avslappnade inställning till arbete också kan ha hjälpt henne att nå så långt. Hon svarar att hon inte vet men att det gjort att hon känt sig avspänd på gott och ont. Det är ofta andra människor som har pushat henne. Bea Feitler övertalade henne att ta det åtråvärda jobbet som ad på Rolling Stone efter att Mary själv avböjt med motiveringen ”No thanks, too much work”. Mary älskar fortfarande Paris där hon bodde när hon jobbade på Vogue. ”I Frankrike sitter inte folk på middagar och bara pratar jobb som folk gör här, där har man ett privatliv också.” Ibland när längtan efter Frankrike blir för stor kilar hon ner till tidningsaffären ett kvarter från Hearst Building och köper på sig franska veckotidningar. Vi berättar att Sverige är ett av de få länder i världen där det som kallas ”mjuka värden” som familjeliv och välbefinnande rankas högre i mätningar är hög inkomst och karriär. Vi tittar ner på gatan där människor springer som galningar. Nej, Mary Shanahan känns fortfarande mer som en västkustflicka än en typisk New York bo. Innan vi går får vi leka med Wired’s app på Marys iPad. Mary blir lyrisk och säger att hon drömmer om att få jobba digitalt. Så om någon vill bli först med att göra fantastiska fotoböcker för iPad – ring Ms Shanahan. Fotografen Annie Leibovitz var faktiskt den som ledde oss till både Bea Feitler och Ruth Ansel. I dokumentären Annie Leibovitz: Life through a lens berättar hon själv om sitt arbetsförhållande med Bea som hon såg som sin mentor. Ruth i sin tur har berättat att Bea, som jobbade målmedvetet på sin karriär knöt fotografer till sig som hon betraktade som ”sina”. Och att hon gärna ville behålla dem för sig själv. 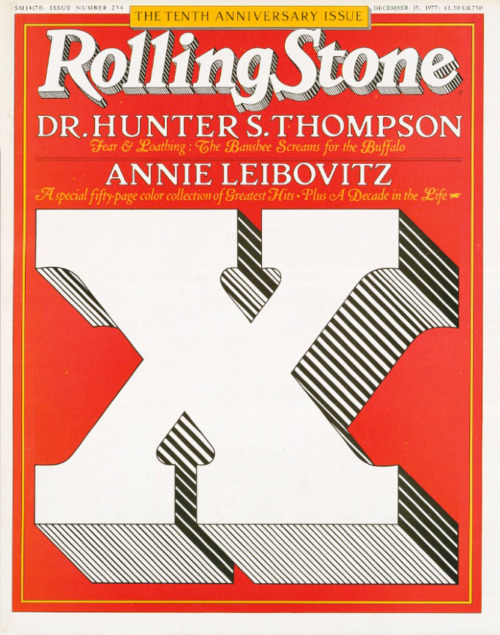 Annie Leibovitz var den fotograf Bea tog med sig när hon blev ad på Rolling Stone. Vi blev väldigt nyfikna när vi hörde Annie Leibovitz tala om Bea Feitler. Det var första gången vi hörde en yrkeskvinna tala om mentorskap mellan kvinnor. Annie sa att det hon lärt av Bea varit avgörande i hennes egen karriär. Hoppa över den jobbiga inledningen på 2 min och lyssna på den här halvtimmeslånga intervjun där hon berättar om sitt imponerande yrkesliv. Hon berättar om den gången hon tjatade sig till att följa med för att plåta John Lennon för första gången. Hon flög tvärs över landet, fortfarande på ungdomsbiljett. Tio år senare tog hon den berömda bilden av en naken John Lennon uppkrupen på Yoko Ono, tagen bara några timmar innan han mördades. Hon berättar också om arbetet med boken At work (omslag av Ruth Ansel) och om när hon porträtterade Queen Elisabeth. Hon hade visst avbrutit drottningen när hon ville kolla på sin favorit TV-show, det kan ha varit en av anledningarna att hennes majestät var lite grumpy. Annie ber drottningen ta av sig sin krona “Ser det inte lite väl ‘dressy’ ut med den på? undrar hon, ”Dressy? !” svarar drottningen. ”Vad tycker du då om det här?” undrar drottningen och sveper med sin stora drottningmantel.